Update: I finally uploaded video stuff to this post. Home now, but connectivity was too spotty where I traveled in Vietnam. 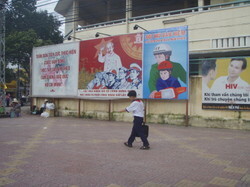 This is not speeding, actually, since Bao Anh is a cautious driver as far as Saigon/Ho Chi Minh City goes. You may feel that crossing the street is a game of roulette. Step into the flow of traffic, maybe with a hand outstretched, and it magically parts for you. 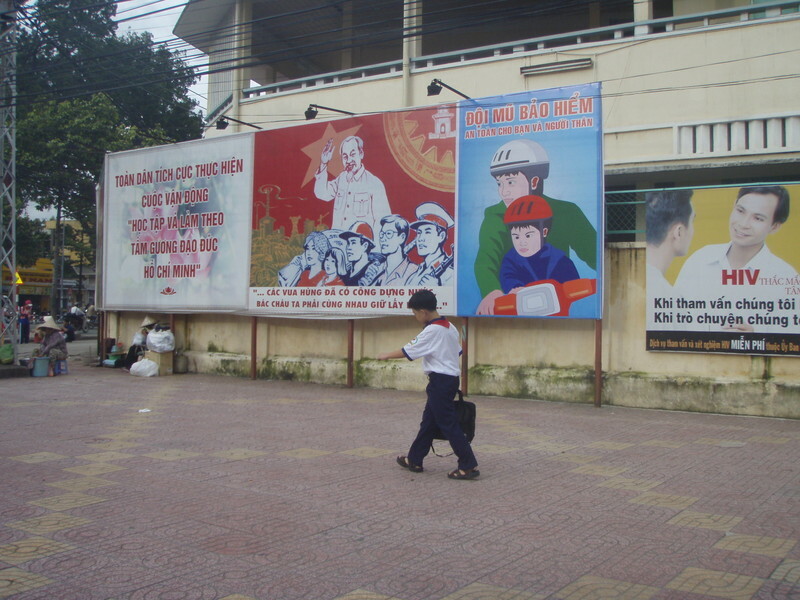 Helmet laws are coming into effect by the year's end (see the billboard, right? I wish I could buy one). By all accounts, traffic and air pollution in urban Vietnam have worsened as more cars have taken to the road since the nation's acceptance into the World Trade Organization in November dropped prices. Vietnam's GDP is growing at the second-fastest rate in Asia, just behind China. People are earning more money. Those who can afford cars and new cell phones every month will splurge. Cars cost double their sticker price due to taxes. Four wheels may be a show-off status symbol, but motorbikes are faster for most commutes. Nobody here is pedaling to work out of any desire to be "green" and save the planet. They're just getting around the best way they can afford. Bicycles are still widespread, used by students and by workers to deliver perilously-balanced loads you'd be arrested for in North America, from bananas to bricks to granite for countertops for so much new construction (Think San Francisco's insane? Real estate here rises about a percent a day). You'll see the occasional electric bicycle, but forget about biofuels. 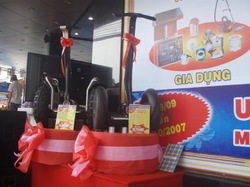 You might spot the rare Segway every few months; a few are parked in front of Nguyen Kim electronics megastore, which is making a gazillionaire out of its 30something namesake.